Almost certainly supplied to Sir Rowland Winn, 5th Bt. (d. 1785), probably for 11 St. James's Square, London, after 1766. C. Gilbert, The Life and Work of Thomas Chippendale, London, 1978, vol. I, pp. 173-4. This bookcase is an exciting addition to the group of bookcases almost certainly made for Sir Rowland Winn of Nostell Priory, Yorkshire, probably for his London house in St. James's Square. One breakfront bookcase of this model remains at Nostell Priory. At least three others are known, of varying sizes, and the present bookcase makes the total group at least five. It is not known when the group was removed from Nostell. The present bookcase had been in the vendor's family for longer than living memory and the Nostell association had been completely forgotten. This might suggest that the group left sometime in the 19th century, an assertion also made in the Sotheby's 1964 catalogue referred to below. Christopher Gilbert identifed one of the breakfront bookcases of this group as 'A Very large mahogany bookcase with Glass doors and a pediment top £38' in Chippendale's 1766 account (loc. cit.). This identification is supported by a reference a year later (1767) to a clothes-press having 'a pediment top... Made to Match your bookcase'. There is a clothes-press at Nostell Priory with very similar cresting to the surviving breakfront bookcase (ibid.). In the 1805 inventory of Nostell Priory by H. Phillips there is a reference to four 'Large Mah'y framed aviaries of Gothic design with brass Wire fronts, drawers, Slides and partitions in 3 parts'. This is surely the group although, for reasons outlined below, it is probable that the group was at least one larger than the four in the inventory. It would not be surprising if a set of bookcases from another, possibly London, house, were not used in one room at Nostell Priory. They might then not be listed as a single set in an inventory, but at least partly as individual bookcases. It is not possible to be certain of the size of the group, despite the mention of four '...Large...in 3 parts' (ie. breakfront) in the 1805 inventory. 1. A breakfront bookcase still at Nostell Priory. 2. A breakfront bookcase in the collection of Lord Moynihan, Carr Manor, Leeds, sold Hollis and Webb house sale, 2 December 1937, lot 692. It was then bought by Dr Carlton Oldfeld, Yorkshire, and probably sold again from the collection of Graham Watson, Sotheby's London, 31 January 1964, lot 287. There is a discrepancy in width measurements. 3. A narrow bookcase in the collection of Lord Moynihan, Carr Manor, Leeds, sold Hollis and Webb house sale, 2 December 1937, lot 693. It was then bought by Dr Carlton Oldfeld, Yorkshire, and probably sold again anonymously, Sotheby's London, 6 February 1970, lot 72. There is a discrepancy in the width measurements in this case also. 5. The present bookcase, which originally had a pediment but has always to have been freestanding. 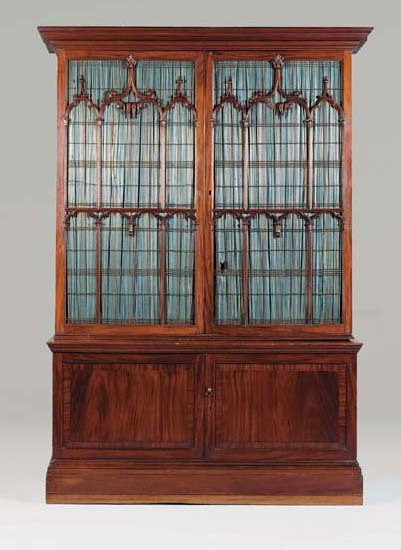 The Sotheby's 1970 bookcase was described as having 'had both its wings removed' although this may have been a response to the fact that the only others then known of the group were winged breakfront bookcases. Certainly the 1970 photograph shows no sign of this and the sides look indistinguishable from the present lot. It seems most likely that the whole group was all used in a large room where bookcases of different sizes were inevitable. The final possibility is that the group was larger still and that the Moynihan bookcases sold in 1937 are not the two sold at Sotheby's in 1964 and 1970. The width discrepancies are quite substantial.